If you come to the symphony music concert, you should not worry: the first instrument you hear will be oboe. By the signal from the concertmaster (the first violin) sends the orchestra gentle, but a little sad (nasal) note (La of one-line octave), and all musicians tune up instruments by this note. Why that is oboe? Because oboe itself can be only slightly tuned and if flute or violin will give note a very exact La, oboe can simply not even hit it. The honor of creating the oboe is assigned to Jean Otter (1605-1690), the ancestor of the famous family of French masters and musicians, and his first presentation by the French Royal Court had been certified approximately in 1660. In 1674 the instrument became known in England. Developing of the construction and mechanisms of oboe had been happening simultaneously and by the example of improving the Boehm flute. Baroque composers - Handel, Albinoni and Vivaldi had been writing concerts for oboe, and Bach had been appointing oboe and it’s type of instruments (oboe de ’amore and oboe di caccia) to play large orchestra parts. 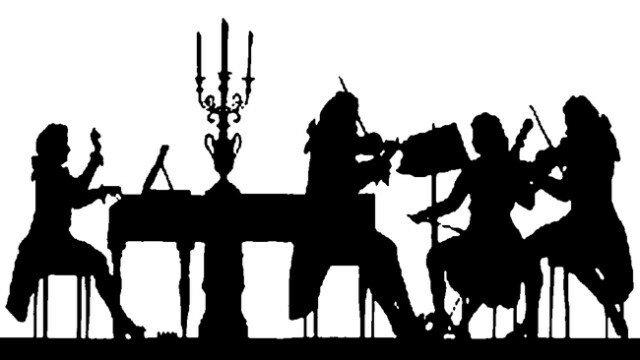 Classicism provided appearing of new virtuosi plays for oboe, including concerts by Mozart, Johann Sebastian Bach and other composers. In 19 century the technical requiments to the oboe as an orchestra instrument had grown, that can be seen in oboe parts in Beethoven, Shubert, Brahms, Maler symphonies. In order to get more sharp sounding, Gustave Maler often was asking to put oboe and other instruments’ bells up horizontally to the audience. The opposite effect could be achieved by muting the oboe with help of the napkin in the bell. The length of the instrument is no longer than 60 cm. The singing range of the contemporary oboe is soprano and constitutes almost 3 octaves: from B of small octave to A of the third-line octave. The low 16 sounds are the main tones, the rest are overtone. The name of the instrument is translated from English and French as “a high tree”. 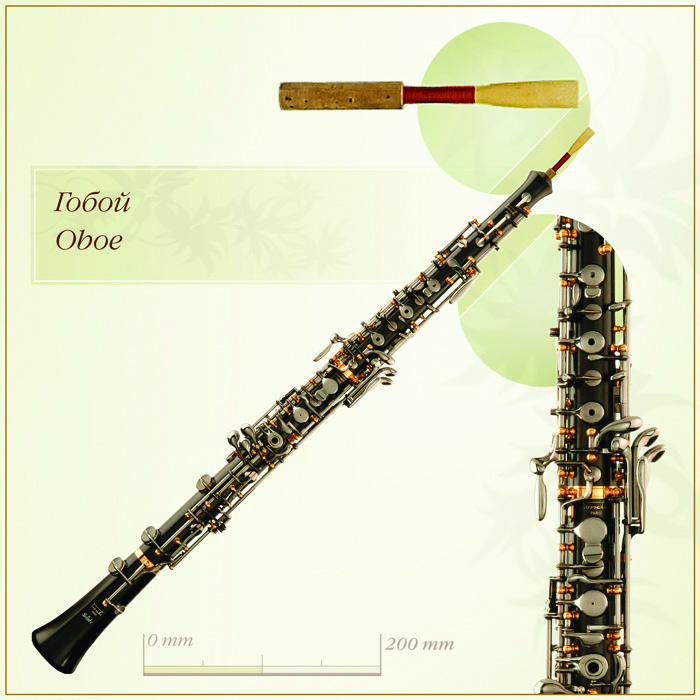 The shell of oboe is normally made from the hard wood, the best material is passionflower. Sometimes the shell is made of other natural material – ebonite. It’s advantage is that it can’t be deformed, that provides precise pitch of the instrument. Oboe looks like a narrowing conical bore consisting of three parts: upper section, lower section and the bell. The bell is widen out and ends up with a metal ring. At the narrow end is put a small stick - pipe, which is than connected to a probe cylinder from one side and a double reed partially covering the pipe – the bore from another side connected by the filar wound, the reeds partially get close, so there is a narrow chink. Oboe can be tuned only by small movement of that stick. Fagot (“bundle of twigs”) is a French word, the first time it was used to describe a double folded wind instrument around 1620. The author of such a smart comparison was a man called Afranio delgIi Albonesi from Pavia. Afranio’s bassoon was more closer to the bagpipe, than to the well-known instrument today. But already in the beginning of the 17th century in France appeared basoon consisting of two joints with “the boot”, that looked very much as a contemporary instrument. In the first part of the 19th century a German self-educated musician and talented master Karl Almenreder (1786-1843) put quit significant changes in the construction of the instrument. Almenreder, who was called “Bohm of Fagot”, added several keys, improved their position, widened and moved fingerholes, that improved and straightened the voice and made playing more convenient and expressive. Basoon looks and sounds very original. Thought the instrument is more than 3 meters long it is quit manageable, because it is somehow is double folded. Normally it is made of maple and consists of four sections: the bell, the bass joint, the boot and the wing joint. Double reed looks very much as an enlarged reed of the cor anglais and if fixed to the elegantly curved S-shaped metal pipe. 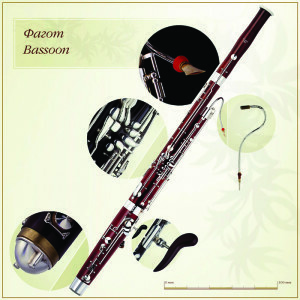 The wide range (about four octaves), rich technical manners and variety of tone colors make the bassoon one of the most expressive and essential orchestra instruments. 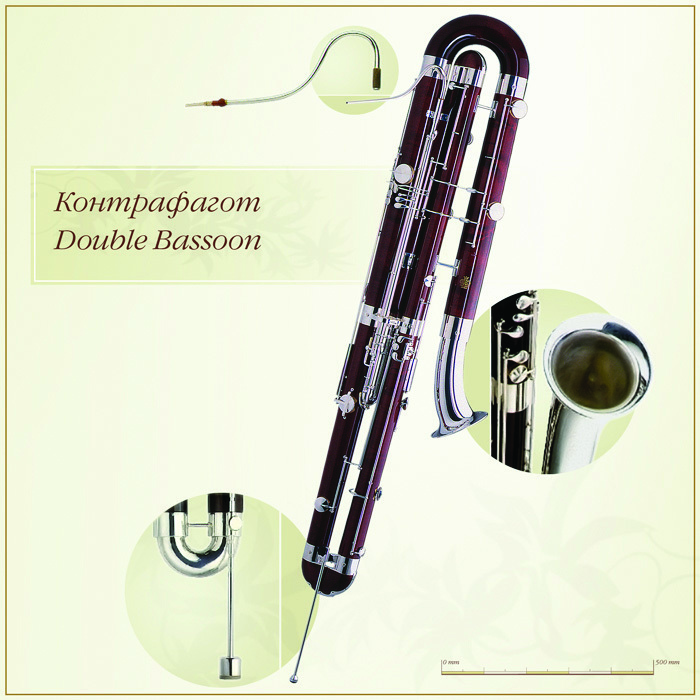 Today there are used two main types of bassoon: French and German. The concert audience can recognize the German bassoon by the white ivory ring at the bell top. Composers Heinrich Schutz (Gemany, aprox. 1580-1672), Jean-Baptiste Lully (France, 1632 – 1687), paid attention to bassoon in there works, Antonio Vivaldi wrote 39 concerts for bassoon. The most prominent musical piece for bassoon of classical times Concert in B-dur, K. 191 (1774) by Wolfgang Amadeus Mozart. Bassoon history in the 20th century is marked by works of Elgar, R. Strauss, Vila-Lobos, Prokofiev (most popular “Humoristic scherzo” for four bassoons), Hindemith, Denisov. The concert for bassoons and low strings by Sofia Gubaidulina (1975) is considered the master piece of contemporary repertoire. In the small bassoon family Double bassoon is one of a kind, but quit bright! Double bassoon is not less colorful than bassoon. It’s three-octave range in one octave lower than by bassoon and reached flat B of subcontraoctave, that is large quarte lower of the lowest sound of bass-viol. So double bassoon definitely possesses the lowest voice in the orchestra. It’s size is also very impressive. You can’t hold it in hands. When playing the instrument is supported by endpin. In the working position double bassoon is not as tall as a bass-viol, but if you incurve that four-times folded “bundle of twigs” (if you remember, that French word “fagot”), it’s length will be not less then five and a half meters. The voice of double bassoon sometimes is compared to the pipe organ sound, but the lowest tunes sound like they borrowed directrly from wild nature… Poets and musicians since old times has been considering that in the lowest and deepest sounds the one is able to hear - the destiny – the doom is embodied. That huge instrument as it had been constructed in the 19th century, consists of four parallel wooden pipes, connected by boot and two U-shaped knees and ending with metal leading down bell. There are other types do exist – with leading up pipe. Some French double bassoon had been made only from metal. Now we need to remind that extremely low voice of the double bassoon is reached only because of the total length of it’s wooden pipes. The thickness and weight if the pipes have no meaning. But exactly these two characteristics give the determined color to the sound. Moreover if such a huge instrument had been done of flute thickness, it would get broken. In order to make such a huge construction stable, it is needed to obtain corresponding design sections for such a construction – not less impressive, and this fact is known not only by musical instruments masters, but by engineers and architects as well.